We’ve all seen those Hallmark cards depicting a sweet old lady sitting in her rocking chair, with her spouse gently feeding the birds. Unfortunately, life isn’t always a Hallmark card. If you find yourself caring for elderly parents, it can be very challenging! Reality hits you in the face when your elderly parents exhibit unusual behaviour. If you are involved in Alzheimer’s care in Toronto, unusual behaviour can actually be the norm. 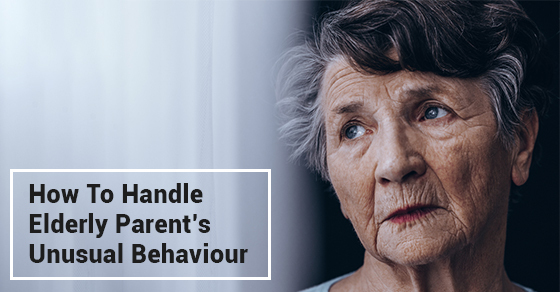 Let’s take a look at some of the more common “unusual behaviours” and how to handle them. Many elderly people will resist bathing and putting on clean clothes everyday. If they had been scrupulous about cleanliness in their youth, this can be quite shocking for you. They may even become belligerent when you try to encourage them to take a shower. Seniors can lose their sense of smell, as well as knowing what day it is. They may not realize that several days have passed since they changed clothes and showered. Their resistance could also be a control issue. They don’t want to be told what to do or when to do it. Don’t argue and nag. This will only make it worse. Try to discover why they are not bathing. It could be fear of falling in the tub. If so, purchase a tub chair. It could be they know they need help but are shy about letting a family member assist them, This might be an opportunity to bring in some outside Alzheimer’s care. They may be more accepting of this solution. Sometimes the most quiet and proper person can become the opposite, if they are suffering from dementia. They will shout obscenities, make crude remarks, or even disrobe publically. Calmly but firmly explain that certain behaviours are unacceptable. Children could be around, and you are embarrassed. That may cause them to stop. If not, it’s best to back off and walk out of the room until they calm down. Distract them with something like photos of a pleasant experience from their past. You may need a visit to their physician if this becomes unbearable. Medication may also help. This can be scary when it happens. Mom or dad are angry for no apparent reason, and they take it out on you. If they live with you, and you have children of your own, this can be especially frightening for them. It can be quite dangerous if seniors become violent, throw things or become out of control. Their anger could be from their own loss of control and always needing help, so they react almost like frustrated little children. First and foremost, try to diffuse the situation. Don’t try to touch or console them. This may only make things worse. Again, walk away until they have calmed down. They may act out and blame you for their situation. Whatever happens, do NOT take it personally. If it reaches a point where you are fearful, ask for help. Their physician may be able to give guidance, or find support from professional Alzheimer caregivers like C-Care Health Services in Toronto. You may find that your elderly loved one is hoarding objects. They may exhibit extreme anxiety about going anywhere, concerns about their safety, be experiencing hallucinations, or suffering from paranoia. These mental issues are common with dementia and require special care. Do your best to make them feel safe. Talk lovingly about how much they mean to you and that you would never let anything happen to them. Certain behaviours like these may require professional expertise from those skilled to handle these issues. Stay upbeat and try to laugh. Sometimes your laughter can become contagious and your loved one will join in. Laughter, or music, can help diffuse many situations. Be calm. Always respond in a reassuring manner. Never try to reason; it will only become more frustrating for you. Ask for help when it becomes too much for you to handle. Alzheimer care in Toronto from C-Care Health Services could be the support you need. Don’t hesitate to contact us.